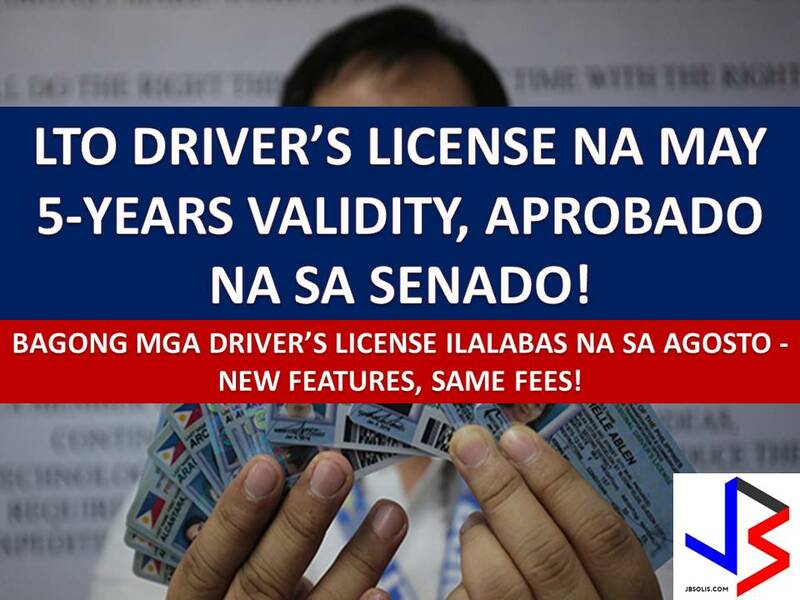 THOUGHTSKOTO Thoughtskoto : Bill Extending Driver's License Validity to 5 Years, Now Approved in Senate! Bill Extending Driver's License Validity to 5 Years, Now Approved in Senate! Starting August, the Land Transportation Office (LTO) will issue the new engraved driver's license. This news is confirmed by the LTO Executive Director Atty. Romeo Vera Cruz after Senate Committee on Public Services approved the bill extending the validity of driver's license from three years to five. Senate Committee on Public Services Chairperson Senator Grace Poe said there is no opposition to the proposals to extend the validity of driver's licenses and it is a "done deal." Poe said while the validity of the driver's license will be extended, its cost will remain the same. New driver's license will be difficult to fake. Security feature - Card photo will have hidden data where the name and license number will appear with the use of lenses. Cards will be engraved and not just printed since LTO already purchased equipment and will produce the cards. Hologram mark so that traffic violations will be uploaded on the system and the barcodes in the license will reflect the changes immediately. The LTO has a budget of P526 million for the issuance of driver's license. The agency also assures that license holder will not be paying additional fees. LTO added that the agency is in the process of revising the examination questions for license applications, especially for professional drivers, to ensure that qualified and disciplined drivers are allowed to drive. Aside from the longer validity, the bill seeks to amend Republic Act No. 136, or the Land Transportation and Traffic Code, as amended by Batas Pambansa Bilang 398, which also seeks a stricter compliance of regulation and stiffer penalties for violators, which would also cover drivers who are not fit to drive. It was last October 2016 when the LTO started the processing of the 5-year validity of driver's license under Under Administrative Order (AO) No. 2016-034.